I was at my LGS on Saturday. 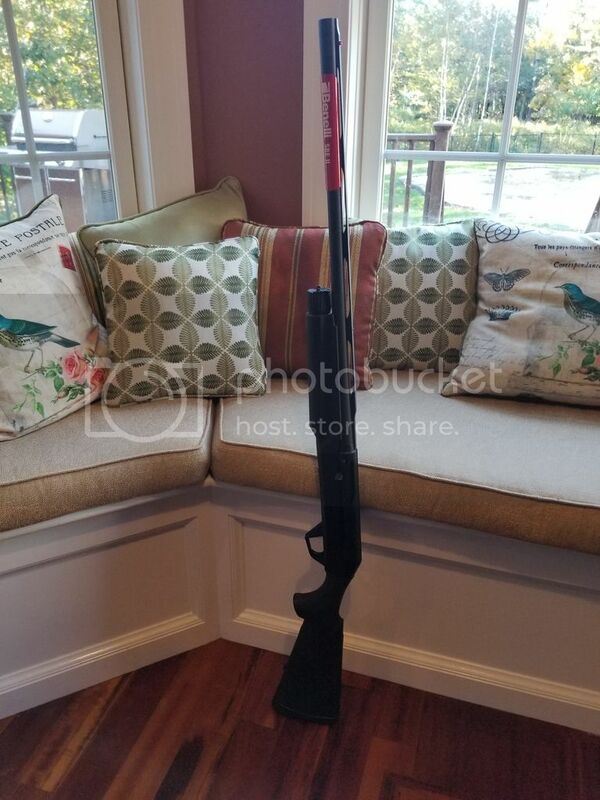 I frequent the place, so wasn't surprised when I saw the same shotgun I've been drooling over for the last two years: a left-handed Benelli Super Black Eagle II with a 24" barrel. The 24" lefties are kind of rare, as they weren't big sellers. He marked it down to $1400 last year, but as I already have a 28" SBEII and a 26" M2, I couldn't justify it. Just too good a deal to pass up. $695??? You would have been insane to pass that up. Nice pickup. Thanks, I'm really happy with it. It's my new turkey and general purpose shotgun. I've already ordered a +6 Nordic Components extension (flush to the end of the barrel) and an over-sized titanium handle for it. Since it’s depreciating so fast I’ll give you $400 before the value reaches $0 and you lose money. I would have asked if he had anymore in the back that were for sale. That is just an incredible price. Hard to believe he could not put it on gunbroker and have gotten more for it. Guessing he just did not want to mess with gunbroker. Good on you. When I read the thread title, I thought I was going to see some POS used shotgun that was bought for a couple hundred. About fell out of my chair when I saw the SBEII and fell out of my chair when I saw $695. Saw $1,250 and thought not bad. Saw $695 and thought DAAAAAAAAAAAAAAAAAAAMMMMMMMMMMMMNNNNNNNNNNNNNN!!!! !!!!!!!!!!!!!!!!!!!!!!!! That was my first thought- why not gunbroker? Probably just didn't want to mess with it. I was a little surprised that someone else didn't buy it to put on GB to make a few hundred on it. Oh well, my win. I'll take it. I have only been that lucky........ ONCE. Have you had issues with other right handed shotguns and if so, what?